To skip to the video instructions go here. This is the first in a series of posts/videos dedicated to wild edible and medicinal plants. Each season I will be covering some of the most easily identified and useful plants that you can use for food and medicine. One of my all-time favorite drinks for the late summer and early fall is Sumac Lemonade. It is made from a plant that is widely distributed throughout most of North America and easily identified. This juice is made from either the staghorn sumac (Rhus typhina) or smooth sumac (Rhus glabra). 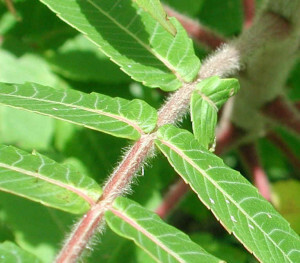 Compound Toothed Leaves: Both species have pinnately compound leaves with serrated edges. 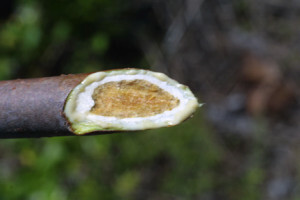 Unique Stems and Twigs: Staghorn sumac has velvet (hairy) twigs and smooth sumac has no hair but instead a fine white powder that is easily removed when touched. Red Fruit Clusters: Since poison sumac has white berries (green early in the season), if you see the red one’s you’re safe. See the following pictures of the two varieties. The strength of the fruit clusters is highly dependent upon the season it’s collected. Ideally, you’ll want to collect them in the mid to late-summer / early-fall time. While you can collect them in the winter, you’ll just need to gather more. It’s best not to gather them right after a heavy rain, since most of the fruit’s tasty acids will have been leached out by then. I usually grab a few of the berries, put them in my mouth and taste them. If they are nice and sour, they’ll make an excellent juice. For a half-gallon of juice, I typically gather enough fruit clusters to fit in a ¼ to ½ gallon container. For this step it’s very important you use cold water and not hot water. Hot water will leach out the tannins and you’ll be left with a bitter medicine and not a tasty refreshing drink. Just grab a big bowl of cold water, throw the berries in there, crush them with your hands and let them sit for a good 10 to 15 minutes. After letting them soak for that time, what you can do is filter out a small amount in a glass cup. You should be left with a liquid that looks anywhere between pink lemonade and cranberry juice. Of course the best test is the taste test. Give it a quick taste, if it’s too mild let it soak a bit longer (or get more berries), if it’s too strong, you can always dilute it a bit with some more water. For the final step, I’ll first filter out as much of the twigs and berries as I can with my hands. After that just grab some cheesecloth, or an old t-shirt (make sure it’s clean), or even some sturdy paper towels (Bounty) and place it over the container you will end up storing it in and filter out the rest of the stuff. It’s as simple as that! If you’re out in the bush you can always make a improvised filter using a big handful of fresh long grass (not grass from someone’s lawn). You can now optionally add sugar or honey to taste or drink it as is (I prefer it this way). What you’re left with is a delicious and healthy drink. I love this stuff too. Great video and blog post! I’m going to add this to my list. Thanks for making this available. Phat post, great looking weblog, added it to my favorites! Hmm, I don’t believe that staghorn sumac grows this far north. But I’ll certainly have to do more searching. Thanks again for a very interesting article! You’re very welcome. Where are you located btw? Staghorn is located mostly in the NE United Staes (although I’ve seen it as an ornamental in Utah). 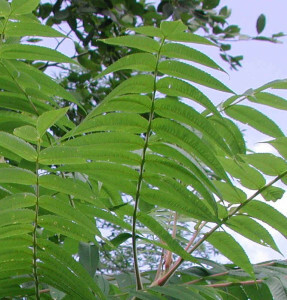 For areas up north you’ll want to look for smooth sumac (Rhus glabra) — its range is far more widespread and it has the same properties and uses as staghorn. First off, thanks for the info. I’ll be sure to try this out. Second, I live in Alabama, and we have it here. I researched it, because I thought the tree looked so neat. It grows in well-drained, sandy soil…lots of light. I had no idea the berries could be used for something. Thanks again! You’re very welcome. Let us know how it works out for you. I live in New England. A Mohawk turned me on to sun tea from sumac. I have an iced tea maker (basically a coffee maker marketed as..) which uses steaming hot water to steep the tea. This shoul get rid of any funguses that might be on the plant. Also, we have the staghorn variety everywhere here in a nice deep red. I’m going to see if I can stock enough to last through the winter. Also, you can rub it on fish, or put a seed tuft in where the entrails used to be and get that citrus flavor. 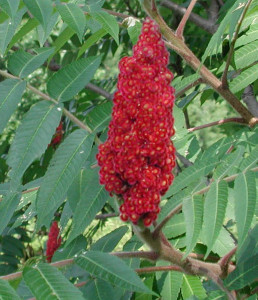 Are all parts of the smooth and staghorn sumac edible? 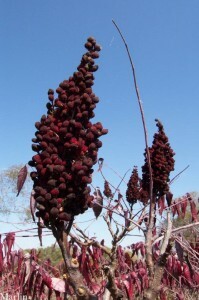 The young shoots of the sumac are also edible but the entire tree is medicinal. i steal sumac from my neighbor and the tea is so sour i add soooo much agave and honey. okay goodnight. 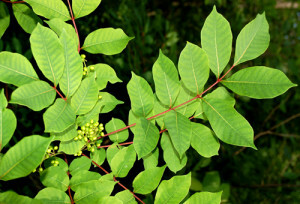 I have seen smooth sumac growing in Canton, NY not far from Potsdam. 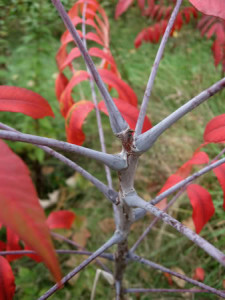 I live in Northwestern Wisconsin and Staghirn Sumac is abundant. Even in my back yard! I came across a winged sumac that is loaded with berry clusters. I touched the berries and my fingers were wet with juice. I gave it a taste and it was delicious. I will be going back to collect a few clusters and make the drink.